Recently while looking thru an antique shop,I ran across a Northwoods #3 dls trap,of course he had a collector price on the trap.I rarely see any at conventions, so in there day were these traps a good piece of coyote hard ware or just not that many manufactured ? There are a few Trappers I know that will buy every # 3 double they find - if in good condition and fairly priced. 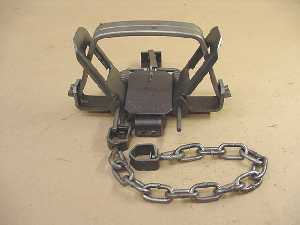 Northwoods was primarily known for coil spring traps. The long springs they made were limited supply. Not only the 3s but the 2s as well. The # 1 and # 1 1/2 are a bit more common but still sell for a good price when you find them. If you are looking for some put a post on trap shed. There are a few people that have them and might part with some. Rodney, it was/is a good trap...one of the first dbls with an adjustable pan. good trap, i have a few dozen and use them regularly. They were great, had adjustable pans and better built than the Victor's in some of the Victor models runs. Really hard to find them today. Money cannot buy you happiness, but it can buy you a trapping license and that's pretty close. In my younger day I had a few of the 2 1/2s that I carried for otter when rat trapping. But the springs were too stout and eventually I traded them off and got 2 1/2 Blake & Lambs. Excellent trap after a whole bunch of tweaking and filing when new. At least the 2 dozen that I owned.